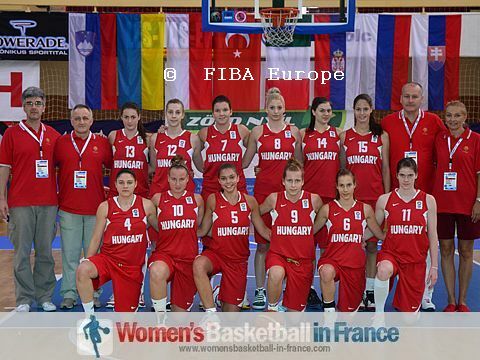 For Division B nations the qualification for the 2013 U19 FIBA World Championship for Women really starts in Miskolc after the preliminary round. The two teams that win promotion this year take part in the European zone qualifiers next summer during the Division A competition. In the summer of 2009, the current hosts Hungary and Slovenia won promotion to Division A. While Hungary struggled and were relegated last year from Division A, Slovenia did well by finishing 4th and hence qualified for the 2011 U19 World Championship. So the prize for promotion this year has a double value for the 12 teams remaining. In Group D, Greece completed the sweep by defeating Norway (80-43). Greece were slow out of the starting blocks, trailing (0-5). They opened their account with a little under five minutes played and just edged the first quarter (11-10). Artemis Spanou (left) sparked her team into action with 7 points as Greece took control (21-14) three minutes into the quarter. Norway then crumpled and conceded 10 points in a row (16-31) and never recovered. Spanou finished with 25 points and 13 rebounds for Greece while Stine Austgulen scored 13 for Norway. Austria needed to beat Latvia to stay in the competition. For 23 minutes they matched Latvia (52-52). Latvia pulled away for good with a 7-0 run (59-52) and stayed in front all the way to the finish (89-71) with 16 points coming from Paula Tomsone. Latvia qualified second in the group with Norway coming third. In Group A, England had already been eliminated and without Christina Gaskin were no match for Belarus. Hanna Kalenta scored 19 points for Belarus in the victory (67-49) for her team to also win the group title. Germany finished second after beating Bulgaria (65-59) with a double-double of 15 points and 10 rebounds by Kristin Annawald. Iva Kostova scored 16 points for Bulgaria. In Group B, Croatia hammered Switzerland (87-22). The game was over as a contest by the end of the first quarter (28-8). Then Croatia continued to play hard going into the locker room leading (49-17). Switzerland could not do much during the final 20 minutes, just scoring 5 points. Ana-Marija Begi led the Croatia attack with 24 points and 10 rebounds. Group B rivals and hosts Hungary made life difficult for themselves against Portugal. Portugal were leading (46-42) with the game in money time. However their inexperience let them down. Fanni Szabó fired in a shot from the land of many to bring Hungary to within 1 point with 1:44 to play. Szabó then gave her side the lead for good (47-46) with 51 seconds left in the game. Portugal had enough fouls to stop the clock without suffering free-throw penalties. Instead they spent 45 seconds chasing the Hungarian players around the court without fouling. By the time they succeeded only 4 seconds remained. Hungary hit one more free throw to secure the victory (48-46) and second place. The Finnish Wolves wrapped up Group C with a comfortable victory against Israel (67-49). Finland put themselves in a strong position after a solid second-quarter performance 18-9 to go into the locker room leading (36-24). Evita Iiskola was the match winner with 18 points, 9 rebounds and 3 assists for the Finns. Keren Mozes compiled a double-double of 15 points and 12 rebounds for Israel. Denmark picked up the last qualifying round place by beating Luxembourg (88-69). The teams qualified for the qualifying round for Group F are as follows: Denmark, Greece, Finland, Israel, Latvia and Norway.